a musical expression, originally uploaded by bbmarie. 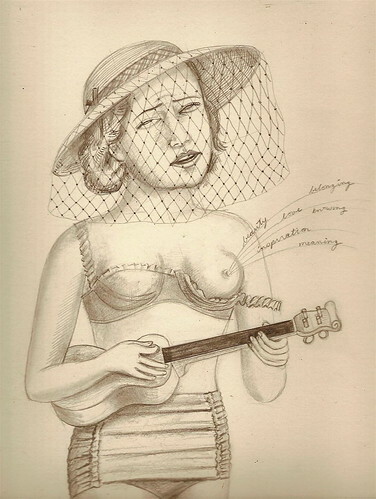 This in a new drawing in a series I am currently working on of ukulele girls. I really like those bathing suites from the 40s and early 50s and I don't know why. When a musician is performing a place in the heavenlies opens up. People hearing can be nourished into their souls. I am talking about soul music. I am talking about mystical breast feeding. This is graphite on heavy printmaking paper. I am using a 1949 Sears catologue for reference material. Women in girdles to follow.